SAN JOSE , Feb 28 2018 (IPS) - Donald Vásquez points to the soil on a farm located in one of the most degraded basins on the Pacific Ocean side of Costa Rica. 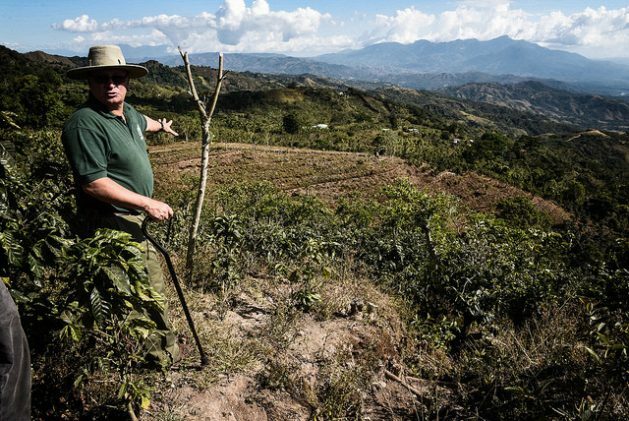 Below, where he points with his index finger, there is a huge layer of white earth, with dozens of bare coffee plants struggling to produce beans in the next harvest. Vásquez lives in one of the towns in the basin, about 60 km from San José, to the west of the Costa Rican Central Valley, within an area at about 1,500 m above sea level dedicated mainly to coffee growing.